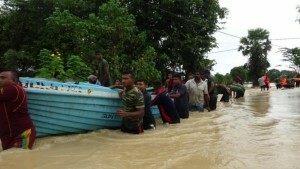 More than 80,000 people from nearly 24,000 families have been affected by floods caused by heavy rain on December 22 in the five main districts of Jaffna, Mannar, Mullaithivu, Vavuniya and Kilinochchi, in the Northern Peninsula, Sri Lanka. The flood affected people have been seeking shelter. A-PAD Sri Lanka assessed the needs of the evacuees, and it has been delivering relief items in cooperation with partner organizations and private companies. “The most affected areas where many houses and farm fields are inundated had been suffered from drought for the last three years. People who were preparing for the year-end and New Year holidays are in a state of shock. 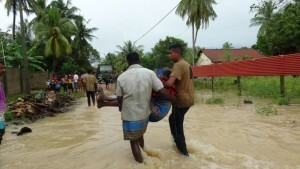 The Sri Lankan government quickly and efficiently responded to the disaster by deploying military personnel and providing emergency shelters and goods to the affected people. A-PAD Sri Lanka will continue to assist and support the people who are not in reach of the government services,” Mr. Firzan Hashim, Country Director at A-PAD Sri Lanka said. A-PAD supports the flood affected people in cooperation with A-PAD Sri Lanka.